At Sweet Threads, our goal is to bring you the latest fashion trends for girls and boys for each season. Dressing and accessorizing for holidays, events and parties is fun for mom and the kids. With spring here and summer right behind it, we wanted to show you some of the latest fiesta fashion that we’ve got in store! Our newest line of apparel, Nena & Co., features some of the hottest trends in kids’ fashion with a unique, festive flair. These handcrafted clothes are sure to make your little one stand out for the occasion! The stylish Mini Bucket Bag is the perfect fiesta bag for your little girl. It’s a trendy accessory that adds a festive flair to your child’s outfit. 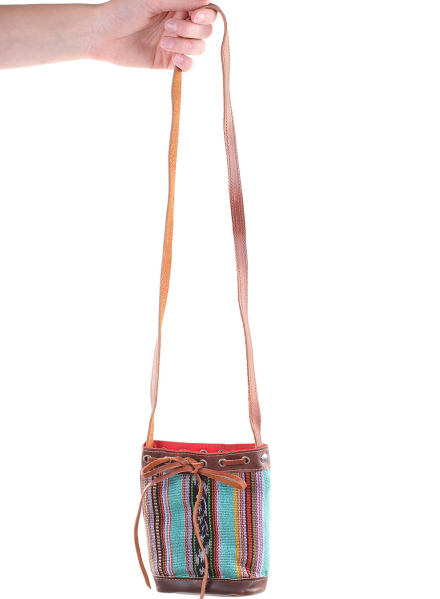 Not to mention, this dreamy bag is made of genuine leather, hand-loomed fabric and has a soft cotton lining. You’ll be enjoying this bag for many years to come! Hand-loomed fabric make these Selena Ruffle Bloomers one of our favorite Festive fashion picks. Bursting with color, these ruffle bloomers match perfectly with this year’s Festive fashion collection. They feature an easy elastic waistband and measure 7.5” from waste to bottom. These cotton bloomers are comfortable for your kids to wear, while making them fashionable for the season. Your littlest one deserves some Festive fashion fashion trends too! The No. 5 Hand Woven Pacifier Clip is the hippest accessory on the market. 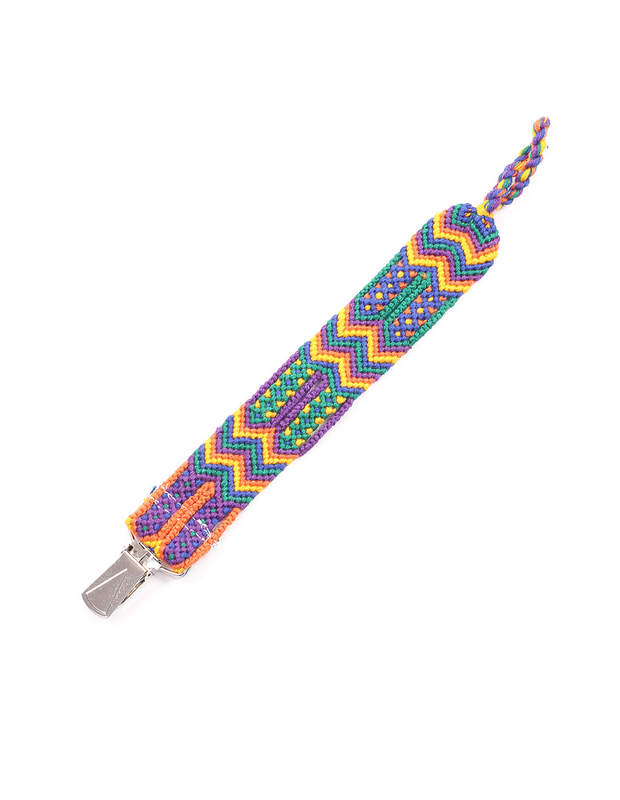 Bright colors with aztec patterns made from 100% cotton, make this clip distinctive and perfect for Festive fashion. It also features a secure metal clasp with a loop to attach a pacifier. Functionality and fashion meet in the middle with this adorable pacifier clip. Join in on the festivities with your own festive fashion accessory. These versatile Vintage Day Bags are made from vintage Maya clothing. Each piece of fabric they use is hand picked and one-of-a-kind. You will NEVER see the same bag twice and you’ll never see another girl with your bag on her shoulder. These day bags can be used as an everyday bag, a gym bag or even a diaper bag. They include an adjustable and removable cross body strap, antique brass metal hardware, one inner pocket, two outer pockets, two side pockets with a snap closure and a zip closure on top. They are made with leather, hand-loomed cotton and feature a soft, cotton lining. With it’s unique and bright design, your Vintage Day Bag is sure to make you the trendiest mom on the block! Now that you’re all dressed up and ready to go, here are some fun May activities in the Los Angeles area for you and the family! Downtown Los Angeles hosts the largest Cinco de Mayo event in the world. Twelve square blocks of downtown Los Angeles will be filled with over a half a million people celebrating Festive fashion on Sunday, April 26th, from 11am-6pm. This event is free to the public and a great way to enjoy the hispanic culture with your family. Let’s get this Cinco de Mayo started right with a 5k. This fun run is a great way to connect with the local community on Saturday May 2nd from 8am-12pm in Long Beach. The run will have a costume contest, piñata breaking party, live bands playing mariachi music and much more. Bring your sombrero and celebrate Festive fashion with the Tacos & Beer Run. If you’re craving authentic Mexican food, this luncheon is the Cinco de Mayo celebration for you! Sunday, May 3rd from 1-4pm in Lakewood, Ca, Double Servings will be whipping up some authentic Mexican food, with a healthy vibe. Utilizing her south of the border culinary skills, this event will feature cultural dishes and alcoholic beverages. This event is for parents only, but if you can get a sitter for this luncheon, you won’t be disappointed! Whatever your style, Sweet Threads is sure to have what you are looking for this season. We have children’s apparel and accessories for every occasion, whether it’s the first day of school or a festive holiday party. Stop by and see us in our Long Beach store or shop online at shopsweetthreads.com.